The wreck of a World War One German submarine is gradually resurfacing on a beach in northern French after decades of being buried in the sand. 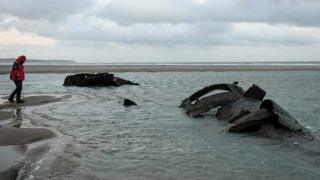 Shifting sand off Wissant, near Calais, is exposing the remains of the UC-61 which was stranded there in July 1917. The crew flooded the vessel and abandoned it and by the 1930s the submarine had largely been buried. It is now becoming a tourist attraction again, although the local mayor warns it may only be a fleeting visit. Since December, two sections of the submarine have been visible at low tide about 330ft (100m) from the dunes. "The wreck is visible briefly every two to three years, depending on the tides and the wind that leads to sand movements, but a good gust of wind and the wreck will disappear again," said Mayor of Wissant Bernard Bracq. However, local tour guide Vincent Schmitt believes the winds and tides could lead to even more of the UC-61 being exposed. "All the residents of Wissant knew there was a submarine here, but the wreck is mostly silted and therefore invisible," he said. "Pieces reappear from time to time, but this is the first time we discover so much." German submarines, known as U-boats, targeted Allied shipping during World War One, sinking hundreds of vessels. Historians say the UC-61 was credited with sinking at least 11 ships, either by laying mines or by firing torpedoes. On its last journey, the submarine had left Zeebrugge in Belgium and was heading to Boulogne-sur-Mer and Le Havre to lay mines when it ran aground. The 26 crewmen surrendered to French authorities.